Scores of Beckenham residents flocked to the War Memorial on November 11 to pay their respects to the fallen soldiers who died in battle as part of borough-wide Remembrance Day services. To mark 100 years since the end of the First World War, locals gathered at the War Memorial at the end of Beckenham High Street to honour those who lost their lives in WW1 and future conflicts. There was a service at 10.50am which included a wreath laying ceremony, followed by a parade. Local councillors were present, including Copers Cope councillor Michael Tickner who laid a wreath, alongside many other local organisations, charities scouts groups and the like. One group which took part in the Remembrance Day services was the Bromley Youth Music Trust. Senior musicians from the youth concert band provided music for the service including a rendition of Elgar’s Nimrod during the laying of the wreathes. Ian Rowe, principal of the BYMT, told News in Beckenham: “Bromley Youth Music Trust were honoured to have been invited to be part of the Remembrance Service at Beckenham memorial. “Special mention should go to Edward East, from Langley Park School for Boys, who played a faultless rendition of the Last Post”. Beckenham War Memorial, which lies on the roundabout that connects the High Street and Croydon Road, was unveiled back in July 1921 by former Sergeant Bert Hanscombe, a local council dustman and one of nine brothers who fought in and survived the First World War. The names of the fallen are recorded on large brass plaques. With over 700 for the First World War and over 300 recorded in H.M. Forces in the Second World War, there are also 12 Civil Defence, 30 Auxiliary Fire Service and 288 civilians recorded (including 22 children) killed during the war. The alteration to the dates to include both wars was completed by Remembrance Day November 1946. 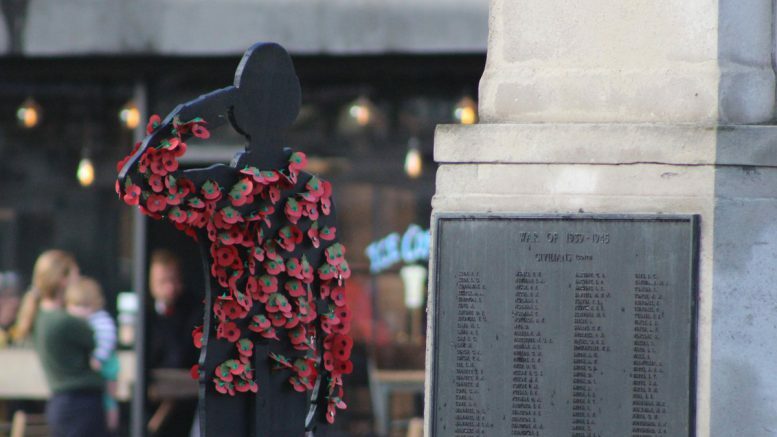 Be the first to comment on "Locals pay tribute to fallen heroes on Remembrance Day"